Hearts manager Robbie Neilson is reminding all who will listen that scoring goals is tough. But even he could not have expected it to prove just as tricky as it has for his Tynecastle strikeforce. While others in the squad have been weighing in, generating five wins and two draws in their opening ten games of the Premiership campaign, the goal return from the club’s four main strikers has been less than sensational. The public refrain is that things will turn, ideally, Neilson says, today, away to Inverness, whom they skelped 5-1 in Gorgie. He adds that the players concerned are possessed of too much quality not to start contributing. But, after they drew another blank to help Kilmarnock to victory on Wednesday, the Hearts boss was asked when he would start to fret that more was not being made of the chances he believes are still being created. “You start worrying when you lose games,” he answered. Having lost in midweek, the fans are worried and for all his public statements of support the Hearts boss must be growing increasingly frustrated by strikers who have amassed fewer goals between them than the club’s right-back, Callum Paterson, has mustered on his own. There has been one apiece for Bjorn Johnsen, Conor Sammon and Tony Watt – all of whom had opportunities to at least double their individual tallies at Rugby Park, all of whom passed them up – while Robbie Muirhead has yet to get off the mark. In four of the five games where points have been dropped this term, the team has come up empty in front of goal, something that is giving rivals hope and has left Hearts in fourth, when they had planned to move to second if the result had gone their way in Ayrshire. 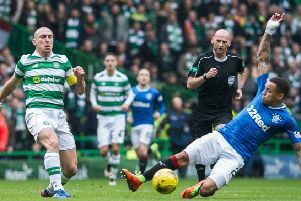 Had Watt made more of a ball in to him, at the back post, in the first few minutes, the outcome could have been different. But Neilson is envisaging a selection shake-up today as the team as a whole tries to find a way to be more incisive and adaptable against those rivals setting themselves up to stifle the capital side.